Did you ever wake up in the middle of the night and feel like designing a gown? Well I have, and I totally understand how you feel if you have. Most recently I’ve thought of gowns as an art form. I could paint on a gown, or use exotic media (toilet paper, banana peels or my old venetian blinds) to build a gown. I could write someone’s poetry on a gown. One recent night I decided an “Art Gown” should be like music. Live music floats into the air then disappears forever. 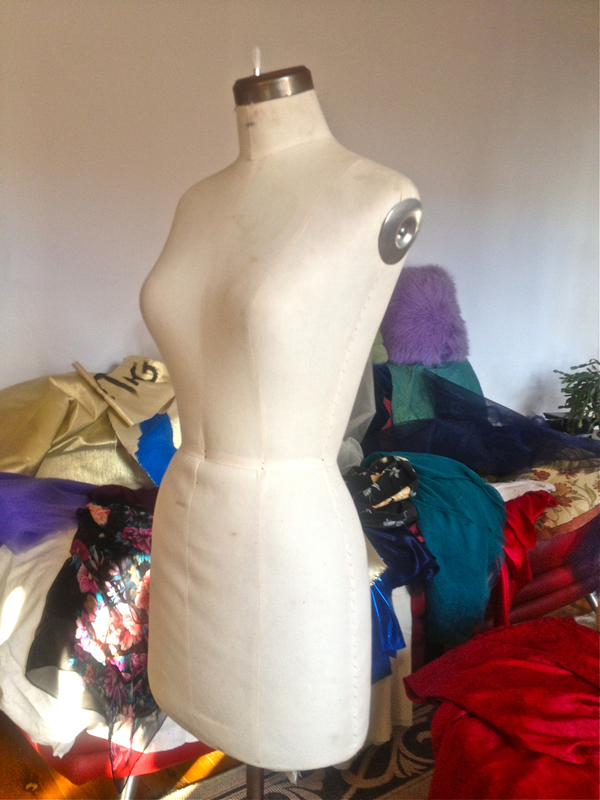 Why not a “Performance Art Gown” that I drape on my Judy then take the pins out and it’s gone forever? Before I take the pins out, why not photograph and name it, like a song performed live, recorded and enjoyed in the future? I tremble as I pull Judy out of the closet. I drag out my stash of fabrics, and make a fabulous and colorful creative mess.I begin pinning away. I like what I’ve started. However, I see that if this gown needs all this tulle underneath, it isn’t as free flowing as I’m thinking for my first “Art Gown” Post. I discover a gorgeous piece of red silk Jacquard that I had forgotten I own. It’s 6 Meters long, 45 inches wide, and it is stunning. I cut 8 inches off the bottom of the piece of fabric. This is to make a waist band and bow. 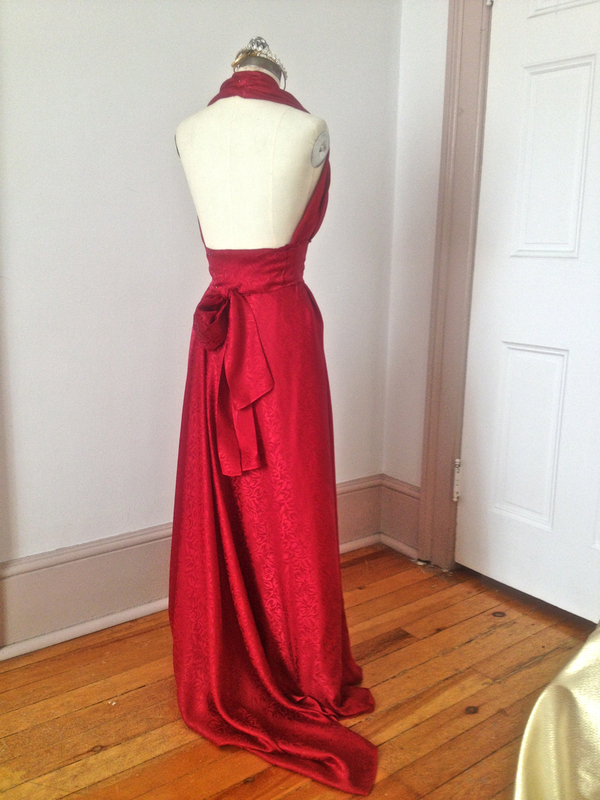 Without cutting into the fabric, I drape it continuously over and around Judy. 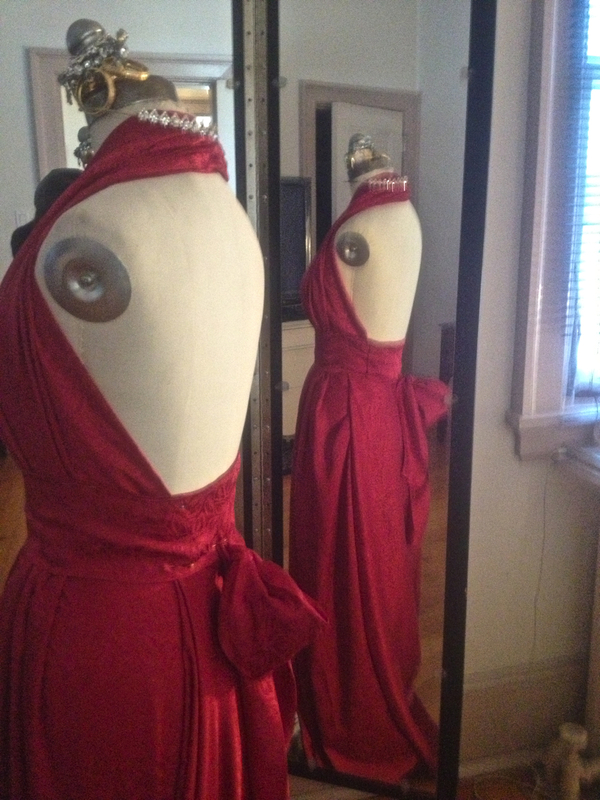 After about an hour, I end up with a softly pleated halter top gown. Boomie , this “Art Gown”, gone forever like a song played live, is for you. It is backless and cinched in heavily at the waist. That fact that the yardage remains uncut, gives the dramatic swoop at the hem finished with a tail. I love it! As I clean up my colorful mess, I think about the fun I had designing Boomie’s gown. I feel like an artist. 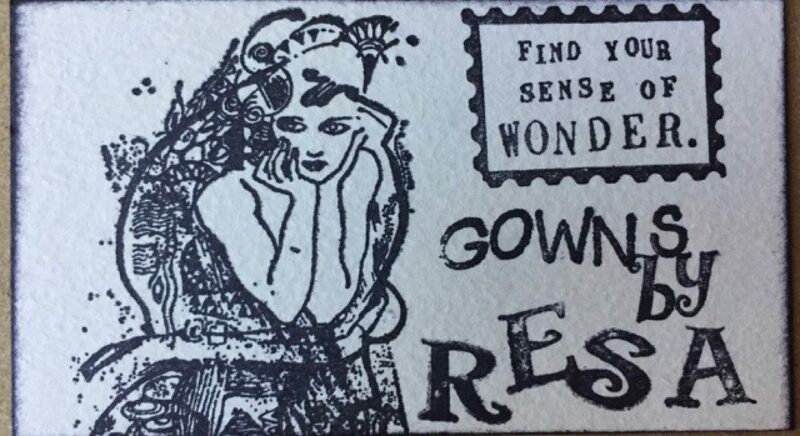 I think of more and different “Art Gowns” I can design for inspiring Blog friends like Carolyn at ABC Of Spirit Talk, Robyn Lee at Through The Healing Lens or, Imelda Evans at Wine, Women & Wordplay. Of course Sherrie, my driver, will need a chauffeur gown. The list goes on like the beat in a song. I wish everyone’s life could be like a gown, long and beautiful! Bless your sweet and wonderful heart. You are mighty talented and that gown is indeed a work of art. I can almost see myself in it and the beautiful silk falling appropriately on my body :). You are too lovely Resa and are a true artist. Thanks for my beautiful gown. I LOVE it!!! You are so awesome. I had so much fun Boomie. That fabric is sooo beautiful and the gown defies description. Actually it doesn’t, but I don’t want to waste it here. I’m going to save my mental picture of your gorgeous dress and use it in a story. Maybe I’ll even make one just for it. So your empheral creation will live on! I love the idea of something beautiful just while it lasts. It encapsulates how I feel about dance, or opera or fireworks. So much work, for something that cannot truly be captured and caught, except in the memory and the heart. Just because it’s beautiful. That we are willing to do so much for beauty’s sake lifts my heart. I’d never thought a dress could be one of these beautiful ephemeral things, but I am very glad to have discovered it is so! Love your work, Resa! Oh Imelda, your words are a joy! Much love back to you, Robyn! 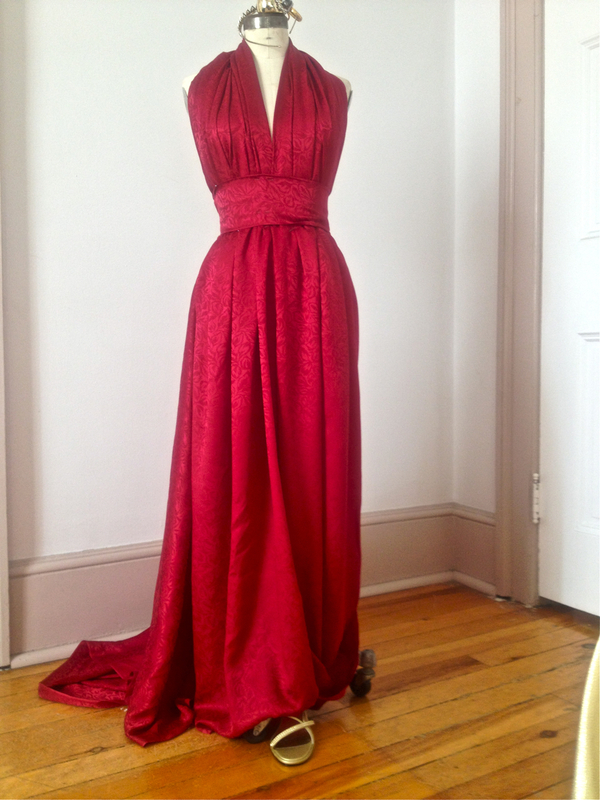 I already have the fabric (raw silk) in my trove for your “Art Gown”. You are a truly inspiring person! I sure Love your words! Since I was a young girl I always wanted to dress all my dolls in gowns, especially “Barbie”. Drop dead gorgeous Resa. A red carpet gown. Fortunate the woman who wears it for she will be taken to knew heights of fashion and beauty. V.
Thank you, Virginia! Drop dead gorgeous! What a wonderful thing to say. I love the colour; it is indeed a masterpiece. Boomie would look grand in this piece; it sings her nature…! I can’t help but wonder what you would do for me…!?! You know a gown for you is inspiring me. Waltzes make me think not just of flowing fabrics, but soft classic colors. What are your heart’s waltz colors? Aha, I wondered yet wasn’t inspired to ask…! Gold is a favourite however, anything that glitters…! it is art – and absolutely elegant. Guy question, how do you know what size it is, is that your size, or is Judy your size? Judy is a size 8. However, Judy’s shape is based on perfect. I know they already wrote this, but, yes, you are an incredibly talented artist, Resa! Ever considered launching your own brand? These creations of yours are so elegant. Your compliment is welcomed! Thank you. I’ve been so busy designing in film that “my thing” has been on hold. It could happen, though. Out of my depth here, but it looks cool! Definitely art. Thank you, John! .. I think it’s art! I can’t imagine ever waking up and wanting to design a gown, but we artists work in different ways, don’t we? For me it would be with words or music. The gown looks beautiful. The fabric and color are stunning. So glad you are back, Resa. I’ve been thinking of you. My mother-in-law passed away yesterday after being ill for a time, so I’ve had a hint of what you are going through. Hugs and blankets to you! Lori! I’m so sorry to hear about your mother in-law. It’s a sad reality. Many hugs and love to you and yours. Honestly, I’ve got to say I’ve been thinking of what kind of a gown I could make out of a patio blanket! That’s true…Holidays are right around the corner! I find your work very inspiring. Great blog! Thanks! I’m over on your Blog right now listening to your song! There is a place for you on Project Runway….I love that show! Lol! Maybe there is a place there for me. Who knows? Your compliment means a world to me. A star for you, my dear Resa…! 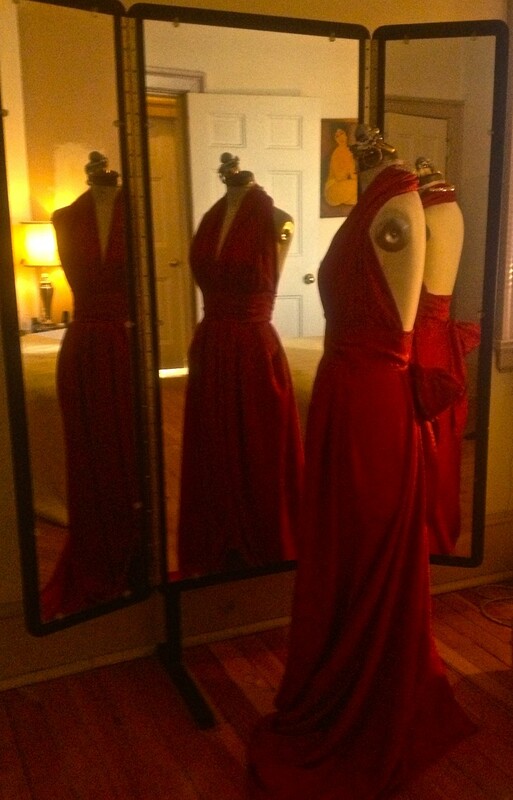 I don’t wear a whole lot of gowns but, if I did, I would probably want that red one to be a staple in my collection. Thank you! I appreciate this comment! From your pic I can tell you would look amazing in a gown like this! Your dark hair and a deep red are beautiful together. It is my pleasure to share these pictures of my “Art Gown”! I enjoyed my time in your blog! Loved this dress especially! Thanks for sharing your designs, you have a lot of creativity! Looking forward to your next post! Thank you, and likewise! You have a lovely Blog yourself! 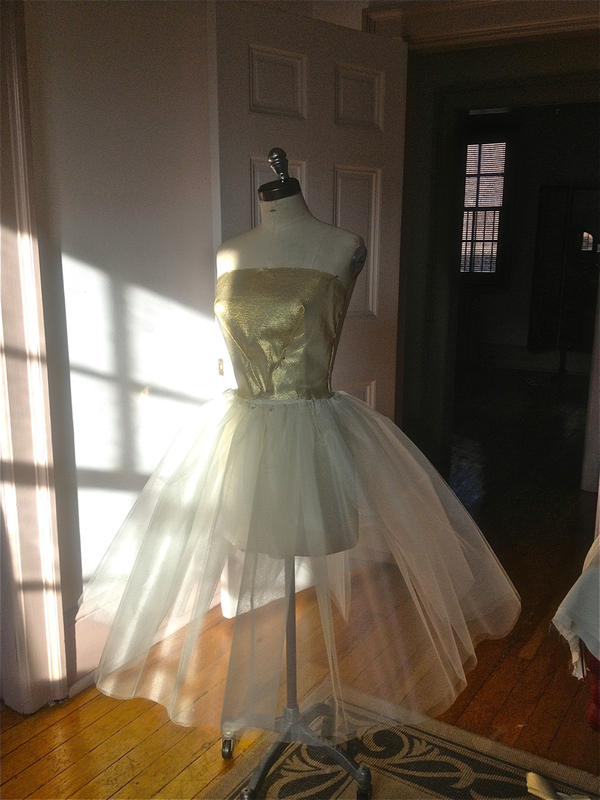 Wow Resa – that dress makes me wish to be young and dashing and have a beauty twirling about in my arms. These all are spectacular. We all want to be young and beautiful, and in some ways we always are. I’m looking to explain the joy of my “Art Gowns” fantasy. yes indeed – and how wonderful that you can plant that thought in our hearts with your art. ha! You figured me out, my bicycle jersey is bright yellow! LOVE! And – my fave color too! Thank you! Your fave color is a real winner in pure silk which is what I’ve used. That’s beautiful. I never woke up with that thought. I’m not the best seamstress but you do that, girl. It’s hot! Thanks! I love doing these “Art Gowns”. Thanks for the inviation! It is an awesome page and filled with awesome gowns. Congratulations. Thank you for coming by, and I’m glad you like the Art Gowns!